Preface. 1. Guide to the book. 2. Basic methods for describing chemical kinetics in condensed media: continuum models. 3. From pair kinetics toward the many–reactant problem. 4. The linear approximation in bimolecular reaction kinetics. 5. The fluctuation–controlled kinetics: the basic formalism of many–point particle densities. 6. The many–particle effects in irreversible A + B → 0 reaction. 7. The many–particle effects in A + B → 0 reaction with particle generation. 8. Systems under birth and death conditions: Lotka and Lotka–Volterra models. 9. Catalytic reactions on solid surfaces. 10. General conclusion. Author Index. Subject Index. 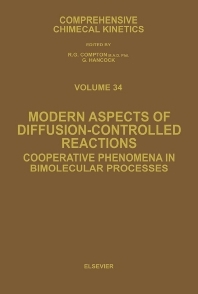 This monograph deals with the effects of reactant spatial correlations arising in the course of basic bimolecular reactions describing defect recombination, energy transfer and exciton annihilation in condensed matter. These effects lead to the kinetics considered abnormal from the standard chemical kinetics point of view. Numerous bimolecular reaction regimes and conditions are analysed in detail. Special attention is paid to the development and numerous applications of a novel, many-point density (MPD) formalism, which is based on Kirkwood's superposition approximation used for decoupling three-particle correlation functions. The book demonstrates that incorporation of the reaction-induced spatial correlations of similar reactants (e.g., vacancy-vacancy) leads to the development of an essentially non-Poisson spectrum of reactant density fluctuations. This can completely change the kinetics at longer times since it no longer obeys the law of mass action. The language of the correlation lengths and critical exponents similar to physics of critical phenomena is used instead. A relation between MPD theory and synergistics is discussed. The validity of the theorem giving a critical complexity for the two-step reactions exhibiting self-organization phenomena is questioned. Theoretical results are illustrated by numerous experimental data.